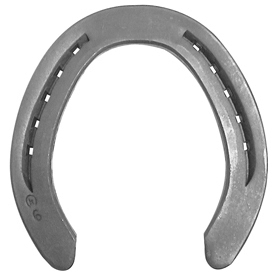 Responding to the North American market’s demand for lighter shoes without clips, Kerckhaert revived the unclipped 3/8" x 1-1/8" series. The shapes correspond to the natural shape of the draft horse. Shoes are symmetrical. Punched for 7 or 8 Regular Head. 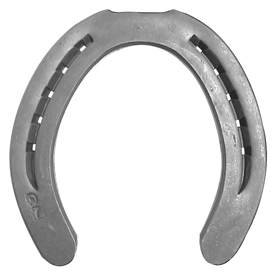 It’s a tradition to toe clip front and hind shoes for the workhorse to prevent the shoes from being driven back during work in the fields or on the streets. Kerckhaert provides a strong clip to make sure the job is done well. These 3/8" x 1-1/8" shoes are symmetrical. Punched for 7 or 8 Regular head. The most demanding of environments won’t overwork these shoes. Anytime the work your horses are asked to do involves rough terrain, this is your most likely choice. 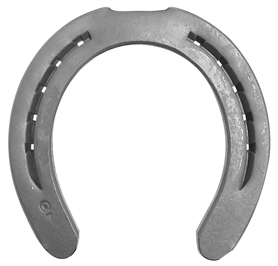 Logging, packing, or whatever you are doing, these shoes have the strength to hold up and protect the hoof. These 1/2" x 1-1/4" shoes are symmetrical. Punched for E-8XL, E-8, E-9 or E-10, depending on size. 1-9 $14.10/pr. 10-29 $13.40/pr. 30+ $12.90/pr. 1-9 $16.70/pr. 10-29 $15.90/pr. 30+ $15.30/pr. 1-9 $16.95/pr. 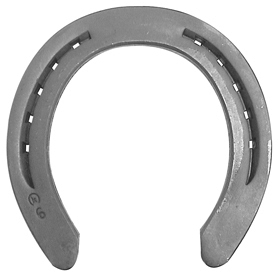 10-29 $16.15/pr. 30+ $15.55/pr.